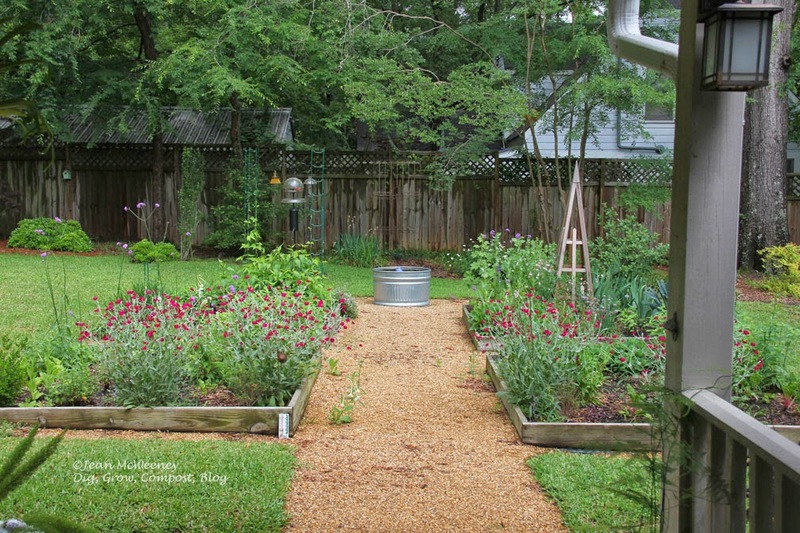 Can it be Garden Bloggers Bloom Day already? And am I really writing a post for it (I usually forget or don't have time)? Yes, here's a short GBBD post for May. 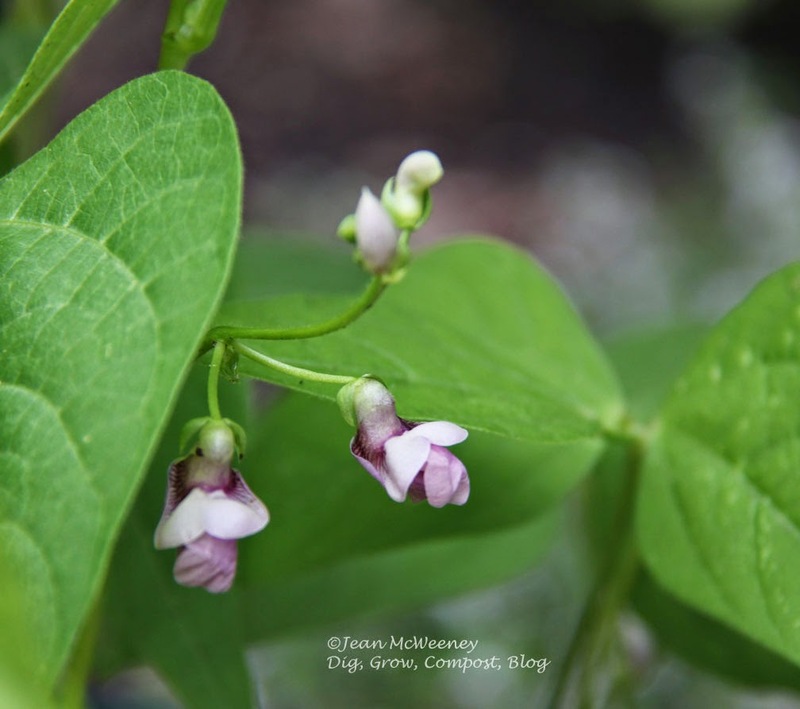 It's short because earlier this month I wrote a post catching up on what's blooming around my yard, and most of those plants are still blooming. But here are a few other plants that have recently put in a star turn. These 'Indian Spring' hollyhocks for one. A few of the veggies are trying to bloom. I say trying because most of my warm-weather veggies are struggling with this crazy spring weather (it's 41F as I write this!). But the green beans, or should I say yellow beans, are starting to bloom. I can't wait to try this haricot vert variety, also from Renee's Garden. Provided I can get to them first before the birds do! 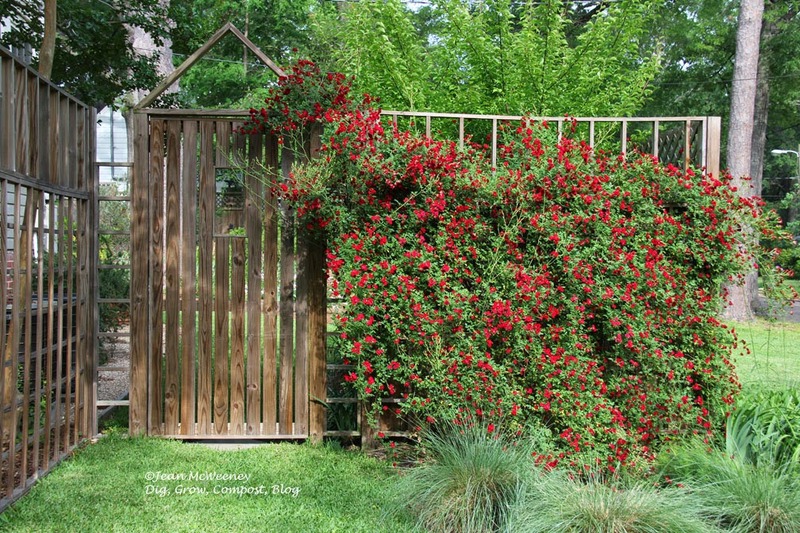 This crazy climbing rose - 'Red Cascade' - is due for a trimming back this year. First I have to let it bloom its heart out. As you can see, it has no trouble doing that. A few other things I didn't show in my previous post include the stick verbena, flowering tobacco, and rose campion. 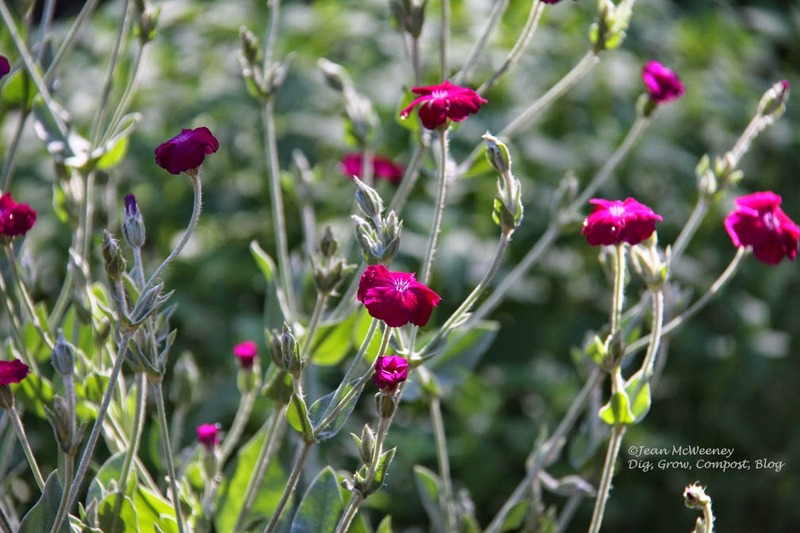 The rose campion, those bright pops of magenta in the photo, was an experiment, so it was planted rather willy-nilly. Next year I will try to ensure they're planted in good spots. Rose campion is really hard to photograph. In the shade it has a deep magenta color but wait for the sun and then it's neon magenta. I think the nicest thing about it, besides the fact that they need very little care, is its soft gray leaves. Okay, I wrote about this peony, 'Monsieur Jules Elie', in my last post. But what a charmer it is this year. I still can't believe I've had almost a dozen blooms from it this year, its third year. I'm a proud momma. 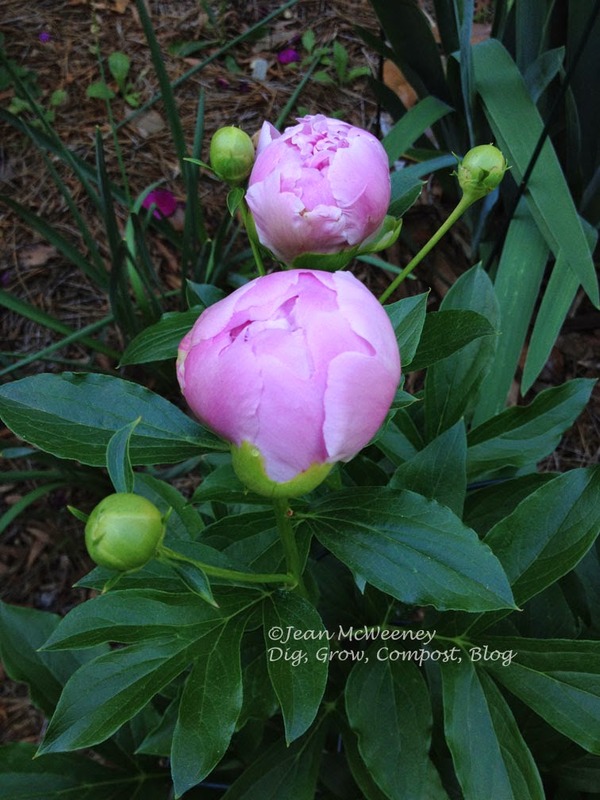 You can see what else is blooming around the world today by visiting Carol's blog, May Dreams Gardens. I love that Rose campion--Jenny at Rock Rose also grows it and I drool every time I see one--so beautiful. You hollyhocks are also stunning. Lovely May post. Beautiful! Hollyhocks in May? How wonderful is that? Oh, I love Hollyhocks so much, but they get terrible rust here in the PNW and look so awful. I prefer the single blooms too. Alison, I've been expecting rust as well but it hasn't shown up yet. Just those darn leafminers. Jean - I love single hollyhocks. And I also loved getting a look at the vegetable garden. Great photo. I love the hollyhocks! So jealous. Your garden is looking great. Hollyhocks! Yours are lovely (they're on my "someday" list for the garden). So many beautiful flowers,in your garden! All flowers that won't bloom in our garden. Glad you shared them with us! I love Rose campion and like you think the gray leaves are stellar. Hollyhocks were my mother's favorite flower and I regret not having enough sun to keep them alive in my garden. I think the singles are superior to the doubles. Your flowers seem way ahead of mine. Your Red Cascades rose is fantastic! I'm late planting my beans out but hope to get the seeds sown tomorrow. It's great yours are already blooming. I have a row of Rose Campion that grow without being planted, but will not bloom until late summer here. I enjoy them, except that they get exuberant in sowing themselves around, but they are so bright. Leslie, I had the same experience with rose campion with it taking forever to bloom. I was just enjoying the leaves for the longest time! 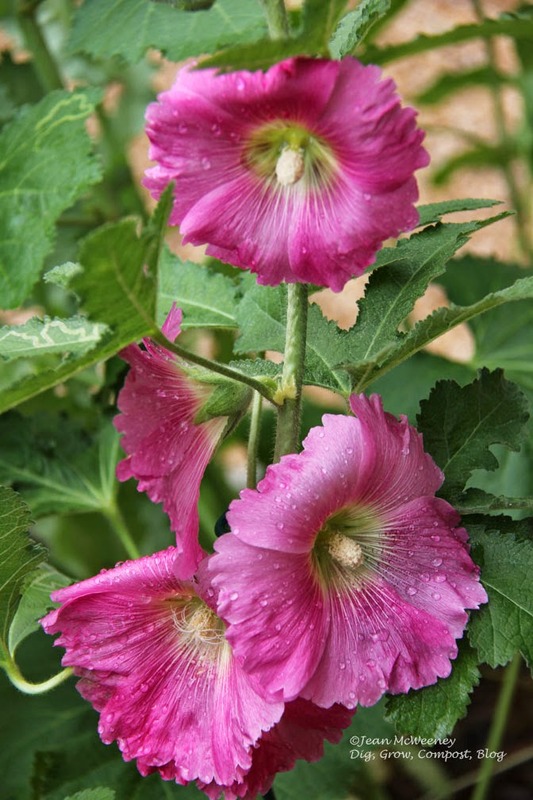 I too prefer the single hollyhock. Unfortunately, a lot of seed companies prefer to sell only the 'improved' double flowered. Beware: Rose Campion took over in two years! 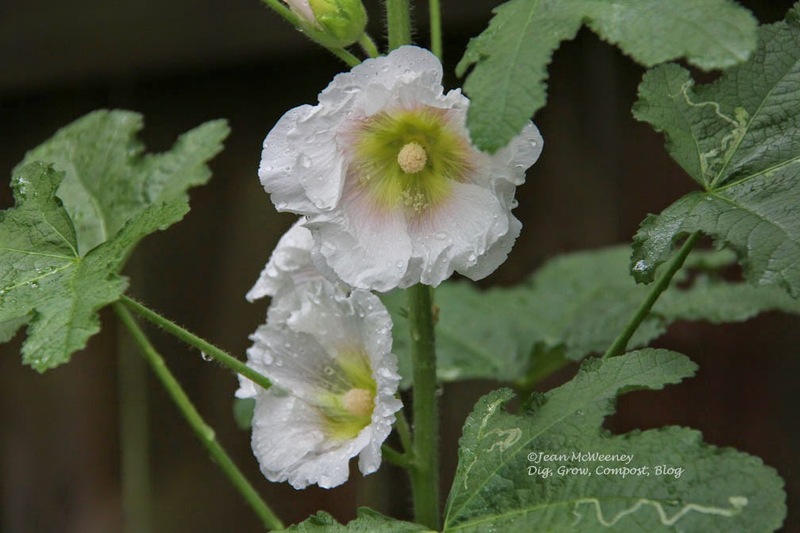 Love your hollyhocks! I have a sentimental attachment to them, because they remind me of my childhood. So many of my hollyhocks have gotten rust the last few years, and sadly their numbers are dwindling. I can't believe it's been so cold for you, too--I haven't even planted beans yet. Your garden is lovely! So many plants I wish I could grow : ) what zone are you in? Hi Laurin - I'm in Zone 8a.